Recall alert! Miss Vickie's is voluntarily recalling its jalapeno-flavoured kettle cooked potato chips due to the potential presence of salmonella in the seasoning used in the product. The recall is the result of a supplier's recent recall of a seasoning blend which includes jalapeno powder that could contain salmonella. The company says no salmonella was found in the seasoning supplied to Miss Vickie's, but it decided out of an abundance of caution to recall the product. 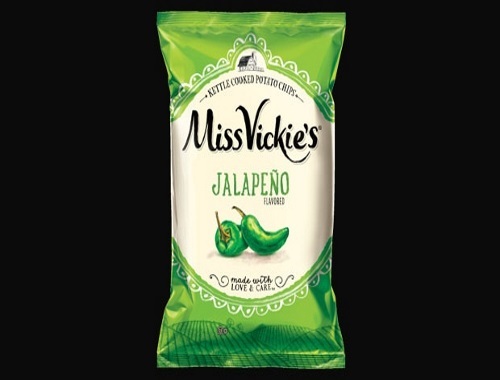 The recall covers only jalapeno-flavoured Miss Vickie's kettle cooked potato chips with "Guaranteed Fresh" dates of June 20 or earlier in 40-gram bags with UPC code 060410001769, 66-gram bags with UPC 060410017142, and 220-gram bags with UPC 060410066386. Salmonella is a bacterium that can cause diarrhea, fever and abdominal cramps, but the company says no illnesses related to the seasoning have been reported. The company is working with the Canadian Food Inspection Agency to ensure the products are removed from the marketplace and no longer distributed. Click here for the CP24 news article.